CHICAGO — The Lakers have ruled Lakers guard Nick Young out for tonight’s game against the Chicago Bulls at United Center for what the team termed a “right leg injury.” The Lakers have not released the results of an MRI Young took on Wednesday after suffering what the team called a strain in his right Achilles tendon in the opening minutes of the Lakers’ 105-88 loss to the New Orleans Pelicans on Tuesday at Smoothie King Center. The Lakers will surely miss Young, who has had a resurgent season thus far under first-year coach Luke Walton by averaging 14.1 points on 45.8 percent shooting in 26.4 minutes as a starter. It does not help that Lakers starting point guard D’Angelo Russell is sidelined for at least another week while rehabbing on his sore left knee. While veteran guard Jose Calderon has started in Russell’s place in six of the past seven games, Young’s absence could either spur Jordan Clarkson, Lou Williams or even Marcelo Huertas to the starting lineup. Clarkson has averaged 15.1 points on 45 percent shooting in 27.8 minutes off the bench, while Williams has posted 16.6 points on a 45.6 percent clip in 23.5 minutes as a reserve. Though Clarkson and Williams lead the Lakers’ in bench scoring, Walton could start seldom-used Huertas for various reasons. Though Huertas has averaged 1.1 points on 25 percent shooting and 2.3 assists in 8.4 minutes through seven appearances, the Lakers like his ability to run a balanced offense. Walton also has stayed reluctant in breaking up the team’s reserves unit since it leads the NBA in scoring (52.4). Apparently, there involves an untold story on why Ron Artest changed his name to Metta World Peace. In a a new sports mockumentary series called “The 5th Quarter” the Lakers’ forward shares a story either real or imagined regarding what went into his name change. The episode will go live at midnight PST on Wednesday, Nov. 30 here. EL SEGUNDO — As the Lakers anxiously wait for two key pieces of their young core to heal, they still cleared up some space in their trainer’s room. 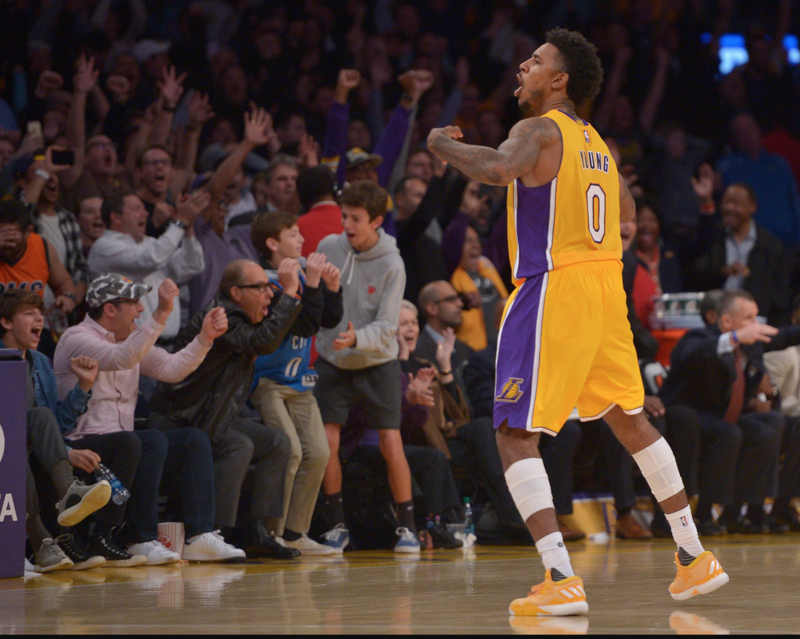 Lakers coach Luke Walton believes forward Nick Young will return for when the Lakers (8-9) play host to the Atlanta Hawks (10-6) on Sunday at Staples Center. After missing Friday’s loss to Golden State because of a sprain in the second toe of his left foot, Young participated in all of Saturday’s practice without any reported setbacks. Meanwhile, Walton expressed uncertainty if forward Julius Randle will play after missing the previous two games with a hip pointer. He tried to complete Saturday’s practice, but was held out for the second half. Randle stayed on the court after practice ended to participate in non-contact two-on-two and shooting drills with some of the Lakers’ assistants. Lakers guard D’Angelo Russell remains sidelined for at least the next two weeks after having a non-invasive procedure earlier this week on his sore left knee. He took some stationary shots in street clothes at the end of practice. Before, Russell watched practice while receiving treatment. It appears the Lakers’ starting lineup appears unclear besides Young (shooting guard), Jose Calderon (point guard) and Timofey Mozgov (point guard). Walton admitted the Lakers coaching staff considered starting backup guard Marcelo Huertas in recent games along with Calderon to avoid disrupting the second unit. Instead, Walton decided to start Jordan Clarkson at shooting guard, rookie Brandon Ingram at small forward and sliding Luol Deng at power forward. OAKLAND — The stoic reaction reflected Brandon Ingram’s personality as the Lakers’ 19-year-old rookie has relied on his actions to speak louder than his words. It also revealed his mindset on both assuming a larger role and handling the pressure that comes with it. Ingram maintained he hardly flinched when he learned shortly before the Lakers’ 149-106 loss to the Golden State Warriors on Wednesday at Oracle Arena that he would start at small forward while Luol Deng would slide at power forward in place of an injured Julius Randle (hip pointer). 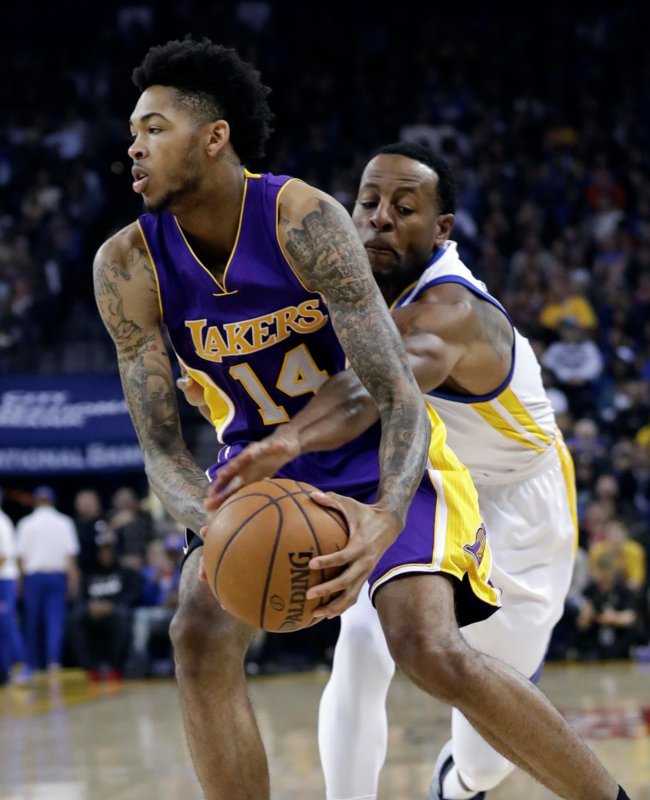 Even though the Lakers hardly had any answer to stop the Warriors’ firepower, Ingram hardly showed many nerves as he posted a career-high 16 points on 6-of-12 shooting and three rebounds in 34 minutes. Lakers coach Luke Walton called the performance “good,” before also noting Ingram’s three turnovers. Before, Ingram had viewed things differently. He never publicly complained about his role to open his rookie season. The Lakers also have liked how Ingram has embraced the learning process as he has assumed ball-handling duties, a post-up role and closeout duties. 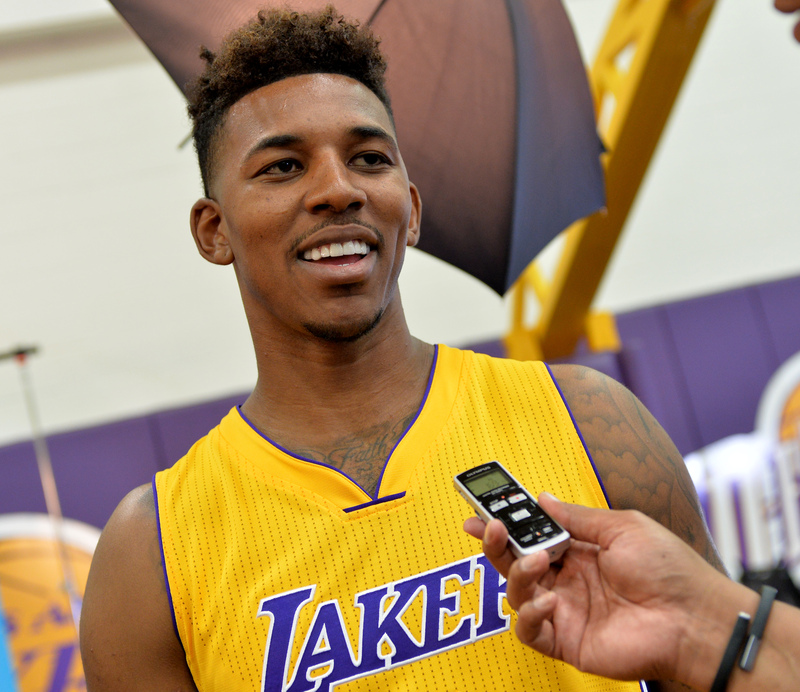 Yet, Ingram admitted the move made him more motivated to prove he was worthy of the start. So while Lakers guard D’Angelo Russell has his development on hold for at least the next two weeks while recovering from a sore left knee, Ingram’s progress advanced to another stage. The job description calls for Jose Calderon to work hard in practice without any guaranteed playing time. The Lakers want him to mentor the team’s younger players without any assurances he will receive anything in return. 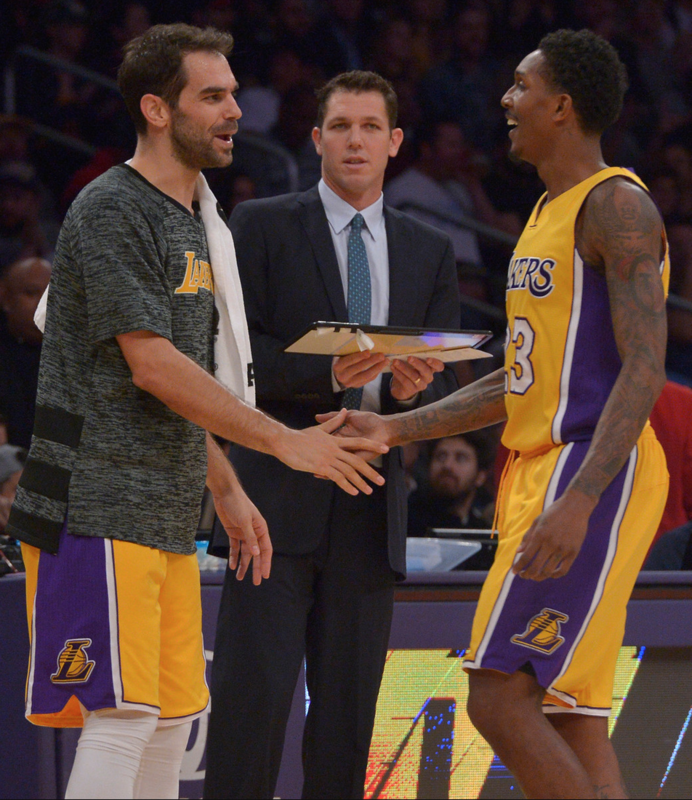 And the Lakers expect Calderon to stay ready to step on the court on short notice. Despite that challenging framework, the early returns suggests Calderon can fulfill that challenge. While Lakers guard D’Angelo Russell missed his second game in a week because of persisting knee soreness, the Lakers secured a 111-109 victory over the Oklahoma City Thunder on Tuesday at Staples Center for reasons beyond Nick Young making a game-winning 3-pointer. Calderon chipped in with 12 points on 4-of-5 shooting, six rebounds and four assists in 22 minutes. He ensured a balanced offense that featured double-digit performances from Jordan Clarkson (18 points), Young (17), Timofey Mozgov (16), Lou Williams (13) and Brandon Ingram (11). And for all the mixed head-scratching and amusement over Young stealing an intended pass for him, Williams pinpointed a different factor that ensured the Lakers (8-7) snapped their 8-game losing streak to the Thunder (8-7). The self-criticisms came out of the Lakers’ mouths much faster than most of their defensive rotations. After the Lakers’ 118-110 loss to the Chicago Bulls on Sunday at Staples Center, it seems safe to say forward Julius Randle would give himself an “F” for his work on Taj Gibson, who had 15 points on 7-of-12 shooting and seven rebounds. It also only took 19 seconds for Gibson to pen the game with a turnaround hook shot. Lakers forward Larry Nance Jr. sounded just as critical. The Bulls outrebounded the Lakers, 56-37. Chicago forward Jimmy Butler lived out his pre-game prediction by scoring 40 points on 14-of-23 shooting. And the Bulls had 60 points in the paint. So even if Nance collected a career-high 18 points and six rebounds, he still outlined something both he and reserve forward Tarik Black could do better. Can the Lakers (7-7) fix those issues when they host the Oklahoma City (8-6) on Tuesday at Staples Center? Good luck. The Lakers rank 27th out of 30 NBA teams in points allowed (109.6). They have the unfortunate task of defending Thunder guard and former UCLA standout Russell Westbrook, who posted a triple double last month against the Lakers. And they face an Oklahoma City team that ranks third in total rebounding (46.6). 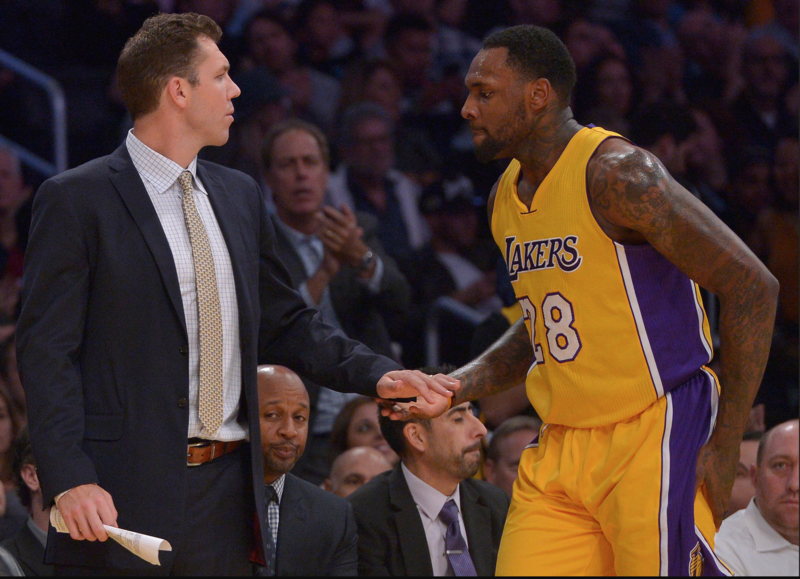 Nonetheless, Lakers coach Luke Walton liked hearing about his players’ self-evaluations. 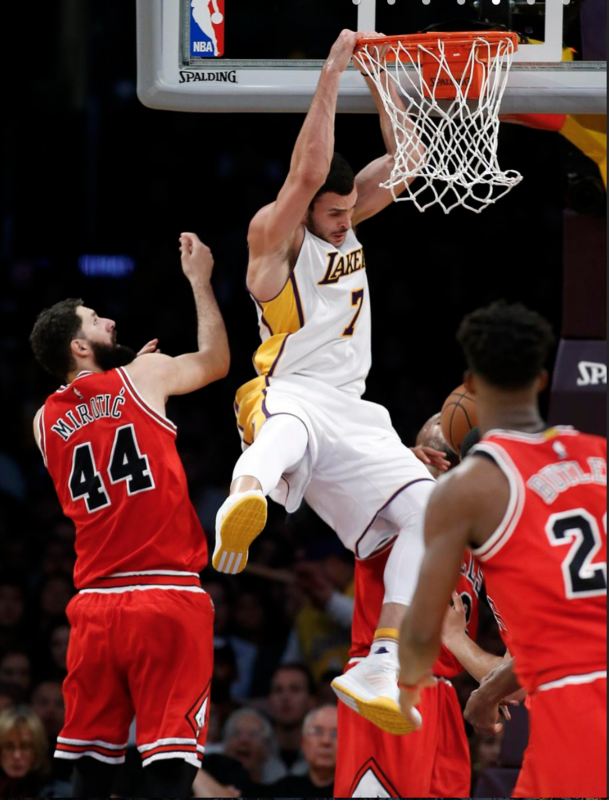 As he continuously fulfills the highlight reels and furthers his case for the 2017 NBA Dunk contest, Lakers forward Larry Nance Jr. outlines a pretty simple explanation for endlessly defying gravity. But as he demonstrated in the Lakers’ 118-110 loss to the Chicago Bulls on Sunday at Staples Center, Nance posted a career-high 18 points on 8-of-11 shooting and six rebounds by not just relying on his athletic abilities. He also showed a knack for fulfilling the old adage in being in the right place at the right time. He threw a tip pass to Lakers forward Tarik Black for an easy basket. Nance slid toward the hoop between defenders for a few putback dunks. He made himself available for open looks. 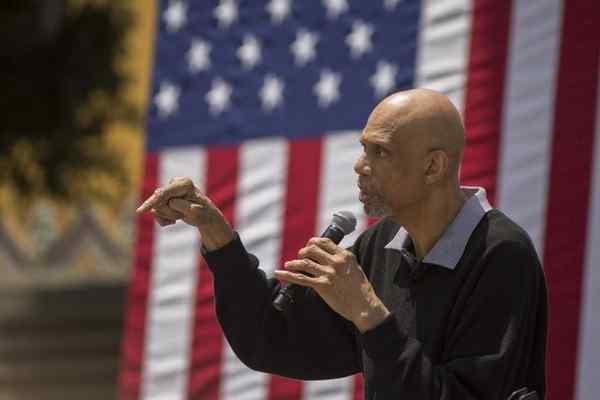 Below is a Q&A with former Lakers and UCLA center Kareem Abdul-Jabbar about his political and social activism, racial inequalities, athletes that take social and political stands, among other issues. You have listed Jackie Robinson, Dr. Martin Luther King, Muhammad Ali and Malcolm X as some of your mentors. What did you learn from them/which messages resonate with you? What racial issues did you experience as a child, college student and even a professional athlete? Abdul-Jabbar: “Every person of color or of a religious minority or exploring gender identity in this country has stories of being discriminated against. My experiences were no worse than theirs. Yes, I was called all the popular racial slurs from the time I was in middle school until today. Every time I write an article I unleash the hounds of racism who bark and snarl in the anonymity of the internet. There are two aspects of racism, and all discrimination. First, is the physical threat. When I was in high school, I was coming come by subway from playing basketball with some friends and got off in Harlem in the middle of a protest demonstration that turned violent. People were running everywhere to escape the violence. Even though I had nothing to do with the protest, I was suddenly running for my life, cursing the fact that I was so tall and therefore more of a target. This awoke me to how much being black was a constant physical threat to my life. The jawing continued as Julius Randle and Tyson Chandler ran down the court and established themselves in the post. Once the officials separated the two and reviewed the scuffle, Randle threw his hands up as a sign to encourage the crowd to express themselves. And after the officials looked at the sequence on the television monitors, they issued double technical fouls for each player. The claps, cheers and jeers began to crescendo. Then the sound peaked after what happened next. Lakers guard D’Angelo Russell inbounded the ball near the top of the key to Randle, setting up a potential play to further antagonize Chandler by going one-on-one. That left Lakers coach Luke Walton standing near halfcourt, debating to himself on whether he should call a timeout. Although Walton has preached to Randle to get in “attack mode,” the Lakers’ coach feared that approach would backfire on that specific play. Yet, former Lakers coach Phil Jackson also has become what Walton called “a big influence in the way I try to coach,” including how Jackson had abstained from calling timeouts at critical times in hopes his players would figure it out for themselves. It turns out the decision worked out. Randle stared at Chandler as if he would charge down the lane at any second. But just as he saw Phoenix guard Devin Booker turn his head toward him, Randle whipped a pass to Jordan Clarkson for an open 3-pointer. Clarkson drained the shot, something that Walton called a “winning play” as part of the Lakers’ 119-108 victory over the Phoenix Suns on Sunday at Staples Center. That play did more than just give the Lakers a 107-97 cushion with 1:27 left. It also revealed Randle’s thought process. The adrenaline flowed seemingly as high as when Larry Nance Jr. leaps and dunks. The Lakers just secured a 117-97 victory over the Golden State Warriors on Friday at Staples Center. The Lakers emulated Golden State’s normal mastery of teamwork and sharp shooting far better than the Warriors did at least for one night. And well, Nance defied gravity once again by throwing down a one-handed dunk while palming the back of David West’s head for support. All of which left Nance soaking in the win by scrolling through Twitter and Instagram posts. That included admiring his own poster. “That was one of my favorite ones I’ve had,” Nance said, smiling. There’s plenty that Nance had. He soared past former Golden State center Festus Ezeli. Nance threw down over Detroit center Andre Drummond. Nance boxed out Memphis forward and former NBA dunk contest champion Vince Carter and converted off of a tip-in dunk. In only Nance’s second NBA season, the Lakers’ forward has dunked enough to warrant a Youtube video providing a top-10 rankings of his slams. Where would Nance rate his latest jam?